Summer also makes me think of Argentina, and my many summers spent in Córdoba — often making ice cream! My Abuela had an old, oblong machine that would sit in the freezer itself, slowly churning the day’s custard, the cord running from inside the freezer out along the wall, to the closest outlet. It would take hours, but it was worth it. It’s no secret we have soft spot for ice cream on ¡dpm does! and with thoughts of summer and Argentina, I find myself turning to an old memory of cassata. Of the very many wonderful and wonderfully sweet things my abuela has made me over the years, cassata is a definite favorite. It’s something of an ice cream cake, layered with all manner of delicious things–chocolate and vanilla, candied fruits and nuts and whipped cream. Yes. It occurred to me–suddenly–on a recent visit to Louis G’s, that spumone is the New York Italian cousin to my Argentinean cassata, and thus, no wonder it’s my favorite flavor at Italian-American ice cream shoppes! 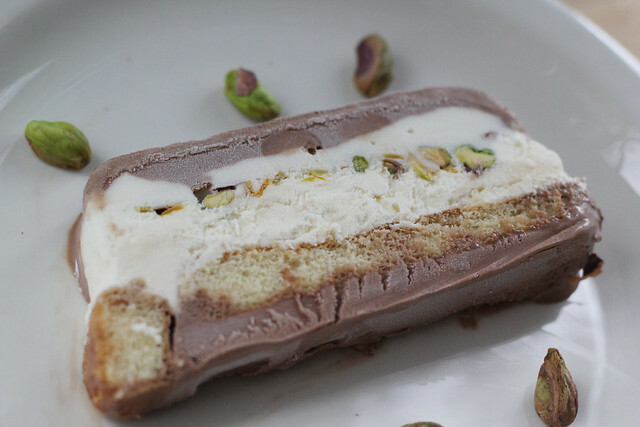 The only constant among the myriad of recipes is the idea that a cassata or spumone is a molded ice cream, consisting of at least two, but no more than three, flavors, with some kind of candied fruit and chopped nut. The other constant? Every entry notes that the concept is all but extinct in Italy itself, but continues to be popular in areas with large populations of Italian immigrants — like Argentina, or Brooklyn. (This would explain why you can get spumone at Louis G’s, a Brooklyn-Italian institution, but not at Fortunato Brother’s, an actual Italian pasticceria.) Aha! En fin. It was of course only a matter of time until we attempted to create our version of cassata à la Abuela Nidia. In Abuela Nidia’s honor, we made each element of the cassata ourselves. (You could of course easily put one together from excellent store-bought options.) For the chocolate ice cream, we made a batch of our favorite chocolate ice cream from David Lebovitz’s The Perfect Scoop. The whipped cream was nothing more than heavy cream with bit of sugar and a dash of vanilla, whipped in our copper bowl. We toasted the pistachios on the stove, and made candied orange and lemon peels a la Leite’s Culinaria (though we rolled ours in sugar at the end, for extra crunchiness.) We didn’t have her ladyfinger molds on hand, so for the this layer we did use store-bought savoiardi cookies, soaked in cognac. Our only deviation from Abuela’s recipe was to substitute ricotta ice cream for the vanilla. Something about the ricotta felt more Italian, and more interesting. To make the ricotta ice cream, we simply made a batch of homemade ricotta, blended in a half cup of cream and a quarter cup of sugar, and froze it for about fifteen minutes in our ice cream maker. This only gave us enough for one layer however, but it turned out for the best, in the end, since we couldn’t have actually fit another layer in our cake mold! The results are delicious. 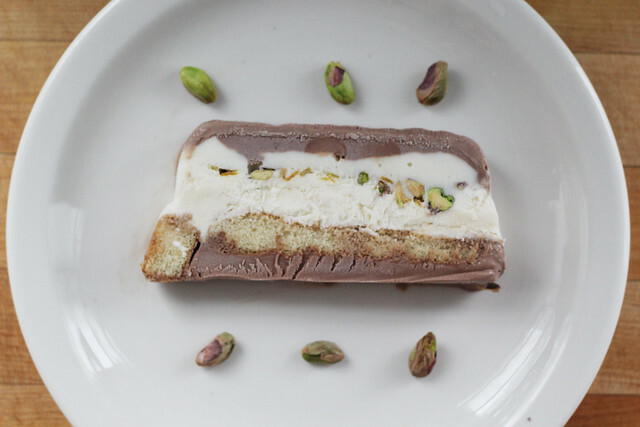 Warm chocolate with hints of cognac and citrus give way to a tart ricotta, the fresh bite of cream and pistachio, and finally the crunch of ladyfinger. Surprisingly refreshing, and elegant, it’s a delightful summer treat! 1. 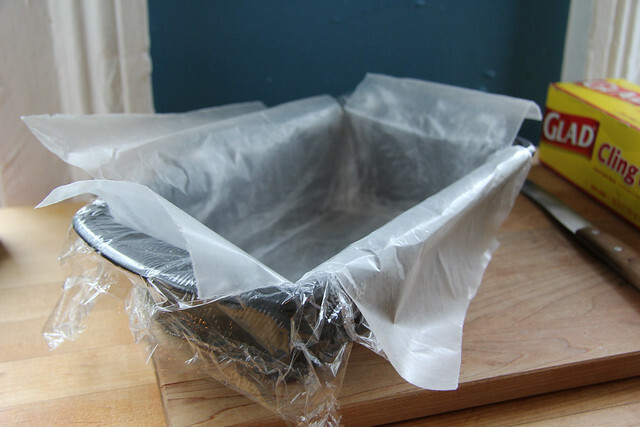 Prepare a rectangular cake mold measuring by laying two pieces of cling wrap crosswise in the mold, then two pieces of parchment paper crosswise above. Leave enough hanging over the edges to act as handles for removing the cake from its mold. Don’t use wax paper like we stupidly did! Use parchment. Wax paper is hard to remove from frozen things! 2. Lay down the following layers, starting with a bottom layer of chocolate, followed by ricotta, etc. Evenly divide the quarts of ice cream between the layers, and smoothing out each layer evenly. You may have to freeze each ice cream layer for a few minutes in between, so that they don’t get too soft and mix together. 3. Press a piece of aluminum foil onto the top most layer, sealing in the layers, and freeze for several hours, or overnight. 4. Ten or so minutes before unmolding, remove the cake from the freezer to soften just a touch. Invert onto a serving dish, lift off the cake mold, and peel off the parchment and cling wrap. Serve immediately, or return to the freezer! When ready to slice, a sharp knife run under very hot water should do the trick. Previous Previous post: capers and caper berries.